Well, I missed getting the newsletter out last week because I was in my fourth week of that awful cold that's going around, and just didn't have enough energy to get everything done. It's almost gone now, thank goodness, and there are quilt shows coming up, new fabrics arriving, and new classes scheduled, so here we go! Go 49ers! We will be closing at 3:30 p.m. this Sunday, February 3, so that we can all watch the Superbowl. We considered closing the shop on Sunday, because everyone seemed to have Superbowl plans, but we have a Crazy Quilting class (which is full), so two of our wonderful staff said they would record the game and work. 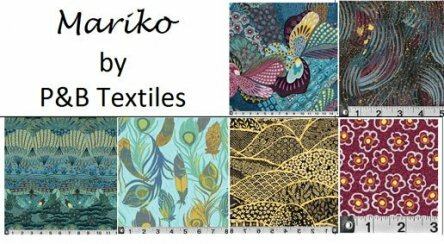 We have two new gorgeous lines: Fabulous Felines by Laurel Burch for Clothworks and Mariko by P&B Textiles. 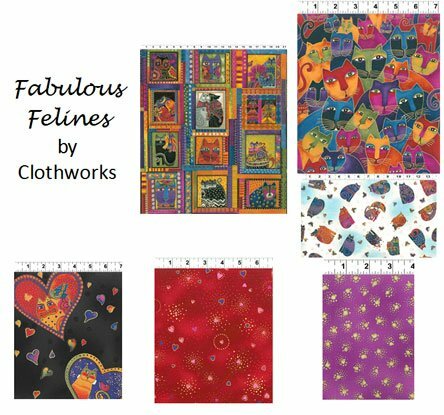 Fabulous Felines features the wonderful Laurel Burch cats in vibrant colors and lots of beautiful coordinating fabrics. We've also restocked our minky shelves and we have three colorways of Stone Rolls from Northcott: Copper Penny, Rosebud, and Sandstone. (There are rolls of 12 fat quarters of Stonehenge fabrics in coordinating colors.) And we've also added some Stonehenge colors to our collection of 108" backings. A note to those of you participating in the Imperial Blooms class: If you signed up for this class, you need to place your order and pay for your background (felted wool) fabric by Sunday, Jan 31. You need slightly more than 1 yd for the quilt, but you can order 1/2 yd to start off with, if you want. We have samples of available colors in the shop. Also, please note that the 1st meeting of the Saturday class for Imperial Blooms will be on Feb 23, 1:00 - 4:00 p.m., not Mar 9, 10 a.m. - 1:00 p.m. Beginning in April, Saturday classes will meet the 2nd Saturday from 10:00 a.m. - 1:00 p.m.
Crazy Quilt Group, Mon, Feb 4, 10:30 a.m. - 1:30 p.m.
Women of Courage BOM, Sat, Feb 9, -OR- Tue, Feb 12, 9:00 - 10:00 a.m.
Greenbrier BOM, Sat, Feb 9, -OR- Tue, Feb 12, 10:00 a.m. - 1:00 p.m. Sit & Sew, Thu, Feb 14, 1:00 - 5:00 p.m.
Blankets for Preemies, Fri, Feb 15, 11:00 a.m. - 3:00 p.m.
We had two great classes last week, Fabric Weaving with Rami Kim and the Pixeladies' Piece Party, and more are coming up. Dana Lahargoue has scheduled another Beginning Machine Quilting Class and a 2-Fabric Applique Class, and Janet Paehlig will teach her Beading Class again on April 14. Here's what coming up in the next few weeks. 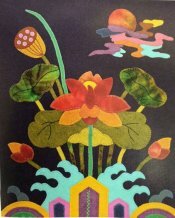 Lotus Blossom Wool Wall Hanging, Rami Kim, Thu, Feb 7, 10:00 a.m. - 3:00 p.m., $48, supply list. Designs such as sun, mountain, water, rock, and cloud represent longevity in Asia because these objects exist eternally in nature. Lotus blossoms symbolize spiritual purity and freedom from the worries of a secular world. In this wool quilt with pennies, all these elements are harmonized through Asian-influenced colors. Perfect for recycling your old wool jacket or skirt for the background. This could be easily expanded into a three-panel quilt wall hanging. 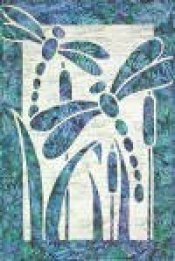 Winter Flower Quilt, Anelie Belden, Sun, Feb 24, 11:00 a.m. - 4:00 p.m., $40, supply list. This is an original pattern by Anelie and uses only three fabrics! 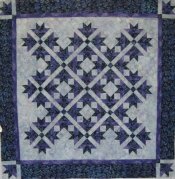 Join Anelie for another one of her fun classes and learn how to make this gorgeous quilt. You should come into the shop and see the sample. This picture just doesn't do it justice. My Favorite Bag, Martha Kunkel, Sat, Mar 2, 10:00 a.m. - 4:00 p.m., $40, supply list. Make a large or small version using the Katie Cupcake pattern. 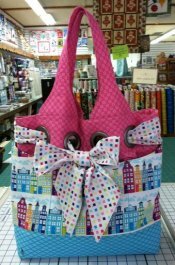 This fun, gorgeous, and practical bag features grommets, a contrasting tie, and many, many pockets. It's so great to be organized and stylish! Maintain Your Bernina and Janome, Susan Berbec, Sun, Mar 24, 11:00 a.m. – 2:00 p.m., $20 fee, supply list. Are you intimidated by the thought of cleaning and lubricating your sewing machine? You shouldn’t be. It’s really very easy and very logical. We will get out the lint, take steps to retard lint build-up and put oil where it’s needed. Please wear your grubbies or a generous apron for this class. We don’t want to get oil, grease or great gobs of goo on your Sunday Go to Meeting clothes. Regardless of what you wear, you will go home with lint in your hair. This class is not a substitute for a full service by a qualified technician. You will learn to maintain your machine in peak condition between services. 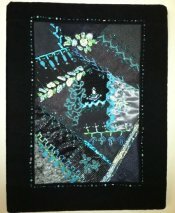 Beginning Machine Quilting, Dana Lahargoue, Thursday, April 25 & May 2, 5:30 - 8:30 p.m., $40 for series, supply list. In the first session, you'll learn machine set up and basic shapes and backgrounds and will have lots of time in class to practice. In the second session, you'll take your new found skills and put them to work on a continuous line design which you can use as a small wall hanging or pillow. This class is the perfect opportunity to learn from a wonderful instructor. Dana is an award winning machine quilter with many years of machine quilting and teaching experience. Collage Vest Workshop, Christine Barnes, Sun, May 19 & Jun 2, 10:00 a.m. - 4:00 p.m., $75, supply list. In this two-day color-and-design workshop, students learn how to collage a variety of raw-edge shapes onto a foundation fabric, zig zag the edges lightly with a neutral thread, and surface stitch through all layers to create a new “fabric.” The workshop covers color, pattern, texture, and design principles, with lots of tips for creating a pleasing composition. On the first day, students will create their collages, zig-zag the raw edges, and begin the surface stitching. They will then have two weeks to complete the surface stitching at home and wash the vest pieces to make them crinkly. At the second meeting, students will cut out the vest fronts and the back and begin to assemble the vest. Instructions will include the Hong Kong seam finishing and binding. 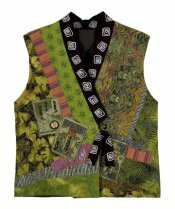 Students can make a vest using their own pattern, or my “Kimono Collage Vest” (fully lined, with collar and ties) or “Crossover Collage Vest” (self-lined and bound on the edges). The same principles and techniques can be used to create a piece for a table runner, purse, or wall art. to get 20% off one purchase! Thank you for being one of our wonderful customers!